Thanks, Mail Carrier | USB to USB? When it comes to technology, I always feel like I'm part hip and part completely baffled. On the one hand, I feel like I can program a remote control or deduce an internet problem without too much trouble... but, on the other hand, when people start talking in acronyms and html, my brain starts to shut down a little bit. 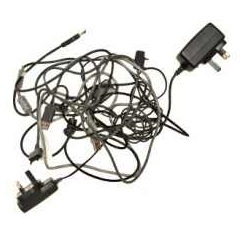 I mean really, can't I just use any old cord to connect my video camera to my computer? Nope, that's apparently not the case. I found that out fairly quickly a year or two ago when I was trying to upload from my aforementioned video camera and nothing seemed to work to make the picture clear. I tried changing the settings, checking the USB, searching every applicable term online... only to eventually find out that there was a problem with the port on the video camera itself. Well, how was I supposed to know that? After more research, it turns out that not all cords are created equally, but a higher price tag doesn't necessarily indicate a better quality. The same cable that retails upwards of $20 or $30 at one site might cost less than a dollar from another location, so it pays to shop around and read a few reviews. As for me, I managed to get my video camera fixed and the clips uploaded, which gave me a smile to watch. Of course, now the big problem is finding the time to edit and do something with them... is there a cord that can help me with that? What about you? Are you tech-savvy or technology-impaired? Do you manage to understand what all the different cables and cords do? I think I am somewhat tech savy, but I didn't realize there were names for different cords. I know which cord goes with which electronic device, but to tell you what kind of cord it is....no way.